I hope Google don’t mind. I was crossing the road yesterday and something very odd happened. I was outside Boston Tea Party standing on the central reservation facing that big clump of trees you can see in the picture. It was dark at the time. Both northbound traffic lanes were empty as far as the eye could see and I set off towards the left hand side of the picture. I was looking straight ahead and walking inside the dotted lines you can see ahead of an ASL. The was a sudden rush of air and a scuffle of bicycle tyres as someone fizzed past me on a bicycle at maybe 15 or 20 mph, within a metre from me. I’ve put a big fat red dotted line to show his trajectory. 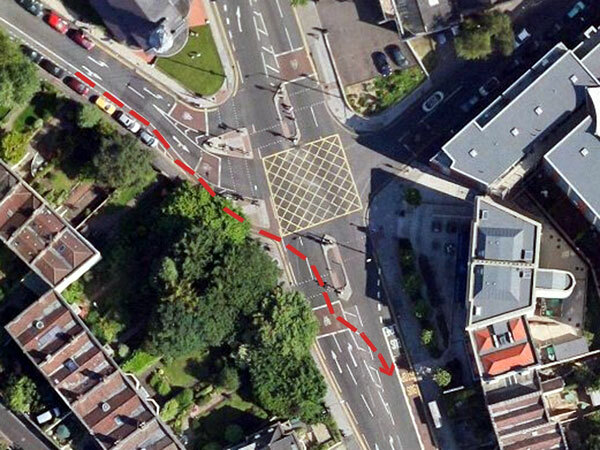 He had come down a hill, cycling in a contraflow cycle lane lane in the wrong direction. He had then turned onto the northbound lanes to head south passing me and then the central reservation on the wrong side before joining the southbound lanes as shown by the dotted line. This is not the first time I have seen this happen on this junction. It seems to be a regular occurrence. Personally I think it’s rank idiocy and I suspect that every time it happens there will be one more sworn enemy of cycling signing up to the This is Bristol comment feature. With idiocy of this calibre, pro-cycling arguments are harder to make. I wish it didn’t happen, but I suppose I have to accept that it always will.